Well, we wrapped up day 2 fairly late yesterday. Fighting the weather, and the mud, and the fog it made for an interesting day. Day 2, for our squad, started at Stage 6. A stage that would have been a lot more fun in dry conditions. Made up of four distinct arrays and shooting positions it utilized pistol and rifle, with all steel targets throughout. The first array was composed on a plate rack, and various 10 x 10 steel targets at about 10 yards. The second array was composed of a plate rack, and 10 10×10 steel targets at about 18 yards, with another set of six 10″ round plates angled off at about 20 yards. The third array was an 8″ plate rack at 50 yards shot with a rifle offhand. The final array was composed of five targets with three micro steel poppers at 70 yards, and two flashers at about 220 yards. A super fun stage. The weather had been heavy rain and thunderstorms throughout the morning and overnight so by the time we had our shot the footing was quite slippery. 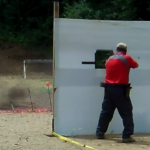 It definitely made everyone less aggressive in moving to each of the four shooting boxes. My performance with the rifle was awesome. With the pistol it was decent except for the 18 yard plate rack. That was poor. Stage 7 was up next. All shotgun. 32 rounds made up of three slug targets, and an array of 12 targets (clays, poppers, and plates). Then you left the barn and headed uphill with a mix of clay and steel targets to the right and left of the path, ending with a sequence of 8 clays scattered at various distances, in a small clearing in the trees. After shooting first on stage 6, I was last of stage 7. While we were shooting the stage we had a couple torrential downpours. It made things interesting. I had issues with the slug targets all weekend. This stage gave me mixed results on the slugs with some good success with the longest and midrange target but I left the closest one standing (I need more slug work). The rest of the stage went well, even my footing heading up the hill which was of significant concern for everyone. Stage 8 was a mix of long range shooting (six targets between 300 and 400 yds) and some close in pistol work with six steel and seven (?) paper. The footing again was an issue and it was all down hill movement to a slick and slippery mud puddle which was the rifle shooting area. Pistol targets went well, and most of the long range targets went well also. The 400 yard ones gave me some grief. Talking to the spotter afterwards he told me, ” You were consistent, the shots went in the same place every time it was just too high”. Thinking about it afterwards, I didn’t compensate for the downhill angle. My hold would have been great for the target over the flat but with the downhill factor it just wasn’t making it happen. We ended the day on Stage 5. A mix of shot, slug and rifle. Starting with one slug target, then a path through clay and steel, followed by more slug, then more steel, then three rifle gongs at 50-60 yds, and then an 8″ plate rack at 110. Since we know my history with slugs this match was not good, I can reinforce that some more. I just had issues with slugs. In this case I left 2 of the 4 targets in play. Steel and clays went without issue. The downhill footing was again pretty treacherous but we all made it safely (stage 7, not so much we had one fall that resulted in a DQ). The rifle, was tough. The gun worked flawlessly and I made it do what I asked. Given the amount of fog on my safety glasses as a result of the humidity though…. it was a little tough and I wound up taking three extra shots on the rifle as a result. All in all, I had a great time, I shot with a great squad, I met some new folks, I exposed some of my weaknesses and reinforced many of my strengths so I know what to work on. While I may have been near the bottom of the list for the prize table I still walked away with some good stuff (THE PRIZE TABLE WAS AWESOME). I am looking forward to running this again next year with improving results.